Note: Olympus appears to be moving towards the E-PL series replacing the original E-P cameras. The E-PL5 gets the optional grip from the E-P3, for example, and is gaining the touch screen, as well. 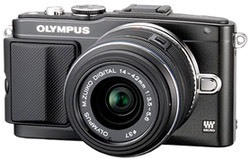 Overall, the E-PL5 represents Olympus 2012 mid-range for their m4/3 cameras, allowing options like the external EVF to accessorize it higher over time, while still keeping it in the "small, slightly de-featured" category to distinguish it from the top end.�The addition of the 16mp sensor brings the E-PL lineup to current standards, and is highly welcome. This is a competent, small camera, with a lot of customization available to the serious user.